Got a lot of stuff? You’re not alone! Visualize the end and work backwards from there. Imagine the feeling of your space, clean and uncluttered. Perhaps you feel a sense of freedom and lightness. Don’t picture things being throw out, think about sharing what you no longer need with someone else who needs it. Next, many people make the mistake of not having a concrete plan as to what they want to get rid of or keep. Usually, more stuff appears than you expect once the purging process begins. All those little items in the cupboards add up. Even a small job can appear to grow rapidly, as if you were driving full-speed towards a mountain. 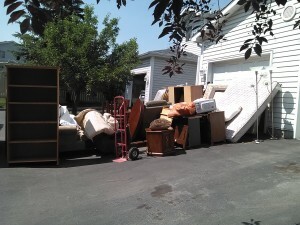 Understand that junk removal can become overwhelming when there are a large number of items. Go into the process knowing this beforehand. Despite our experience, even WE become overwhelmed at times. Pushing past the size of a job is essential! Keep visualizing the end result. Imagine those shelves in the basement laundry room empty, and all of the cupboards bare. Once you visualize an image, that image can fight any sense of dread that appears as item after item goes, yet the junk pile seems to continue growing. Now that you’ve visualized what it will look like, beware of “staygo”s- they complicate things. A mental swamp bogs down your perfect plan to have all of that useless stuff fly out the door. Decisions about what to keep and what to toss never seem to end. Playing “staygo” will melt your brain after only an hour, to be sure. Ask yourself this question: “If I keep this (insert junk), is it going to end up back in some cupboard or dark corner?” The last thing you want is to keep stuff that’s just going to force you to have to purge again in another round. Despite the temptation, keep this question at the top of your mind. Lastly, keep in mind somebody else will find better use for your old stuff it if you let it go, so don’t worry about it. Regardless if you have a multi-room job with a lot of small items, it helps to treat each room as a separate job. Split a large job up into several smaller ones. In fact, this trick helps give you the feeling of satisfaction and accomplishment several times during your junk removal Calgary job.